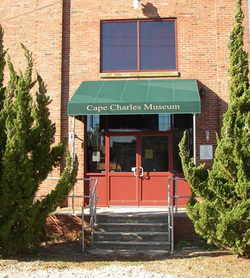 The Cape Charles Museum and Welcome Center opened in 1996 and is dedicated to preserving and presenting to the public the history of Cape Charles and surrounding areas. It is the hope of the Cape Charles Historical Society that inspiration from the richness of its past will help guide Cape Charles' renewal and growth. The Town of Cape Charles was laid out in 1884 to be the southern terminus of the newly formed New York, Philadelphia & Norfolk (NYP&N) Railroad and the transfer point to elegant steamers traveling across the Bay to Norfolk. 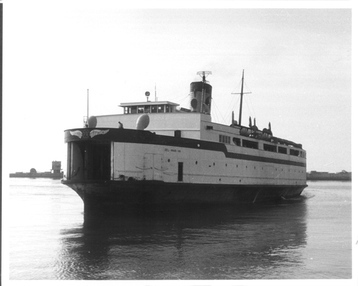 The town was a busy place for many years: four trains a day from NY, with automobile ferries added in 1931. 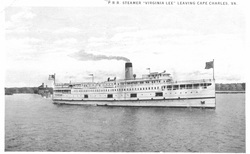 But in 1950 the ferries moved to Kiptopeke Terminal seven miles south; Pennsylvania RR steamer service ceased in 1953, passenger trains in 1958. 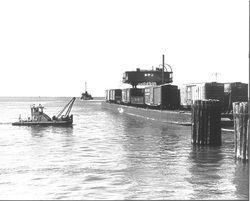 Freight passage via the link to tug and railroad barge continues to this day in one of the few such operations in the United States. The architecture of Cape Charles houses has surprising aesthetic and historic interest thanks to a wide variety of styles and gingerbread ornamentation on the older houses. There are also fine examples of Sears Roebuck mail order houses from the 1920s. A walk or bike ride through Cape Charles is a good complement to a Museum visit. Built by the Eastern Shore Public Service Company in 1947 to house two diesel powered electric generators and subsequently acquired by Delmarva Power, the Museum Building served as a peaking unit facility into the 1980s. One of the engines, a 16 1/2" bore Busch-Sulzer diesel fuel injection model, remains in the building as a permanent exhibit. It has been re-engineered to run as a demonstration unit, and the motion of the pistons and crankshaft can be viewed through Plexiglas windows. The diesel which fueled the engines was delivered by rail from the line which runs behind the Museum. Freight trains still pass by to be loaded on barges at the railroad dock in Cape Charles Harbor and drawn by tug across the Bay to Little Creek in Norfolk, as implemented by Alexander Cassatt and William Scott, the town's 19th century founders. 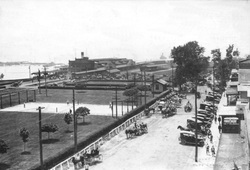 Scott, a wealthy Pennsylvania rail and coal magnate and close associate of Grover Cleveland, created a large and successful truck farm beside the new town. This farm is now the Bay Creek development and golf course. Alexander Cassatt was the brother of Mary Cassatt, the noted American Impressionist painter who spent most of her life in France. 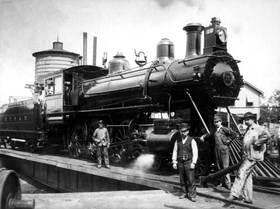 Following his stint on the Eastern Shore, Cassatt rejoined the Pennsylvania Railroad in 1899 as president and introduced a number of technical innovations including the introduction of the air brake. His crowning achievement was the construction of the Pennsylvania Terminal in Manhattan, which required tunneling under the Hudson River. Unfortunately he did not live to see its completion, and the terminal was razed in the 1960s replaced by the Madison Square Garden complex. The Society's caboose and baggage car are now located on the Museum siding, following the 2002 construction of a connecting switch to the Eastern Shore Railroad line. The former Bloxom passenger station, dating from the early 1900s and donated to the Society in 1999, has been reconstructed just east of the Museum building. Exhibits and Collections: The Historical Society has a rich collection of early postcards, photographs, timetables, documents, and objects which encompass the beginnings of Cape Charles in the 1880s, its houses, churches, schools, harbor and beachfront, commercial enterprises, railroad, and ships. Local history is presented via “story boards” and models of Eastern Shore sailing vessels, steamers, workboats, barges, and ferries; railroad china, switch locks; Indian artifacts; school memorabilia including a 3-foot megaphone used at 1950s football games. An exhibit from the Museum's "Country Store Collection" features a set of old hand tools. Visitors may also learn about the Chesapeake Bay crater, the largest in the U.S., created 35 million years ago, including a collection of rocks from the 1 mile core sample taken near Cape Charles in 2005, and a number of handouts from the USGS. Google “Chesapeake Bay crater” and you will find lots more about it. Other Resources. The Museum has a small shop with Eastern Shore postcards, books and other items, including DVDs of a 1947 film entitled, “The Story of Mr. Hobbs.” This was the last film of Nell Shipman, a notable Canadian silent film actress and producer of the early 1900s, and it was shot in Cape Charles, giving us an animated portrait of the town in mid 20th century. Among the books are many by local authors providing history and travel information for the area. In its welcome center role, the Museum stocks brochures and maps to assist travelers, as well as handouts on a variety of subjects. Museum workers are knowledgeable and always ready to help and advise. 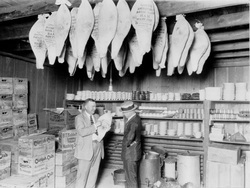 As part of its mission, the Society collects and records memories of older residents and notable events. Fifteen interviews have been transcribed, and are available for reading at the Museum. Digital copies may also be requested: send an email to ccmuseum@hughes.net. 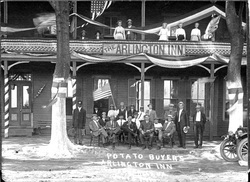 We welcome donations of documents, artifacts, postcards, etc related to the history of the area. Twice each year the Historical Society holds fundraising events: a Low Country Shrimp Boil on the Saturday of Garden Week, the last weekend in April, and an Oyster Roast on the Saturday after Thanksgiving. Tickets are $35 for the Oyster Roast, $30 for the Shrimp Boil. Children 7 to 12 are $10 for both events, under 7 free. They may be purchased by credit card over the Internet by sending an email to ccmuseum@hughes.net. Call the Museum for current information at 757-331-1008.
from mid April through November. The Cape Charles Historical Society has about 200 memberships from 18 states. New members and special donations are always welcome! Send your contribution with membership information to us at P.O. Box 11, Cape Charles VA 23310. Your contributions help maintain and expand the Museum and its archives, and are tax deductible. The Cape Charles Historical Society recently established a Legacy Society to recognize people who have made provisions to pass funds to the organization’s endowment through their estates. A sizable endowment would assure the longevity of the Museum by providing a regular source of operating funds. Please call us at 757-442-2821 if you would like more information. A form is attached to notify the Society of your plans. CCHS Legacy Society members will be honored and deeply thanked. Cape Charles is readily accessible from the Norfolk - Virginia Beach area and from Delaware and Maryland's Eastern Shore. Take U.S. 13 and follow signs to Cape Charles, about 10 miles north of the entrance to the Chesapeake Bay Bridge Tunnel. Go west on State Route 184. The Museum is 1.8 miles from the intersection of Rt. 13 and Rt. 184, a tall brick building on the south (left) side of the road as you enter the town, just past the water tower.